a3Genealogy: Was Your Ancestor Lynched? 5 Tips to Researching Lynched Victims and Mobs? There are not clear statistics of the US lynchings prior to 1882. However, during the Civil War, the Reconstruction Era, and up to the depression era at least 4743 people were lynched according to newspaper accounts, court records and church records. Perhaps the tension of the Civil War brought this activity into popularity, or the fear of losing power, or the anger toward sympathetics and abolitionists, but US lynchings affected every southern state. The open lands of the new frontier, even California, was not spared. 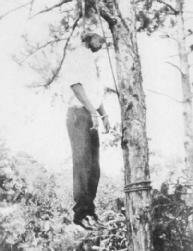 Matter of fact, all but Massachusetts, New Hampshire, Rhode Island and Vermont recorded lynches. Although over 90% of the victims were African American, there were also white victims, mostly transplants from the northern states. The majority of the victims in Alabama, Georgia, Louisiana, and Mississippi were carried out by lynch mobs. Of course Florida, the Carolinas, Tennessee, and Kentucky also had notable numbers. Lynching victims were not limited to men. A woman in California was lynched as early as 1851. Internet Search: The Finding Josephine blog post "Was My Ancestor Lynched?" lists several places to look for names. If you are searching for your ancestor’s possible involvement in a lynch mob or information on an ancestor’s demise, you may wish to begin with a simple internet search. There are many reprints or news articles with names, and histories. 1. Historical American Lynching: One of the better search sites for names, states and reason for being lynched is the Historical American Lynching (HAL) Data Collection Project. You must download the HAL Excel File, but you may search by name or state.This information is based on the NAACP Lynching Records that can be located at Tuskegee University. 2. Collections: Check with a local college/university collection. Be sure to ask the check the catalog of dissertations and search under the popular keywords. These dissertations may not be in the normal library catalog. A doctoral thesis, of let’s say within sociology, may take a more personal social approach analyzing activities using names and citing court records. In 2008 the University of Washington name 3000 known US lynch victims collected as a research project. This list of names is available. Maria Delongoria wrote a dissertation, Stranger Fruit: The Lynching of Black Women, where she lists names of “Black Female Lynching Victims” between 1886-1957 on pages 160-164. 3. The Laws: Check to see if any anti-lynching laws were put into place, or special sentences. By reviewing these hearings, you may find the reason why a new law was implemented, and you may even find your ancestor’s name attached to it. I usually start with a database like Lexis Nexis for these types of legal searches.You may find the names of those incited lynch mobs, as well as victims. 4. Local Newspapers: Local black newspapers kept relatively good records of lynching activities in their area. Rural black news may be reported by the largest town’s paper, but this news was often carried by word of mouth, so I suggest double checking the accuracy. Church news, like the Star Zion of the AME Zion church, also reported these activities. 5. Lynch Mobs: If your lynched ancestor was a white sympathetic, or part of a lynch mob, be sure to check the Democratic paper. Remember the Democratic party was labeled rebels and Republican were considered progressive Most southern towns had both a Democratic and a Republican paper; (their views can be easily identified). Those involved in lynch mobs were often hailed as heroes in the Democrat's paper. Originally printed 27 May 2010, Five Strategies to Finding Lynch Victims, in response to the blog post Was My Ancestor Lynched?, by Dionne Ford. The Billie Holiday’s song Strange Fruit  is also linked on her blog post. Like the lyrics of this song, Dionne's post on the Finding Josephine blog and the subsequent comments, remind us that this too, albeit ugly, is a part of our history. Thanks, Kathleen for this synopsis of our country's lynching history and the places one might look to find out about their ancestors who were a part of this terrible history. Thanks too as always for reading my post!